A: Your appearance is one reason. Another is that the gap left by a missing tooth can mean greater strain is put on teeth on each side. A gap can also mean your ‘bite’ is affected, because the teeth next to the space can lean into the gap and alter the way the upper and lower teeth bite together. This can then lead to food getting packed into the gap, which causes both decay and gum disease. A: This depends on the number of teeth missing and on where they are in the mouth. The condition of the other teeth also affects the decision. There are three main ways to replace the missing teeth. The first is with a removable false tooth or teeth – a partial denture. The second is with a fixed bridge. A bridge is usually used where there are fewer teeth to replace. The third is implants. Q: What is a partial denture? A: This is a plate with a number of false teeth on it. It may be all plastic or a mixture of metal and plastic. Both types may have retaining clips (clasps), to help keep the denture in place in the mouth. Depending on where they are, some of these clips may be visible when you smile or open your mouth. A denture must be removed for cleaning, and should be left out at night to allow the mouth to recover. 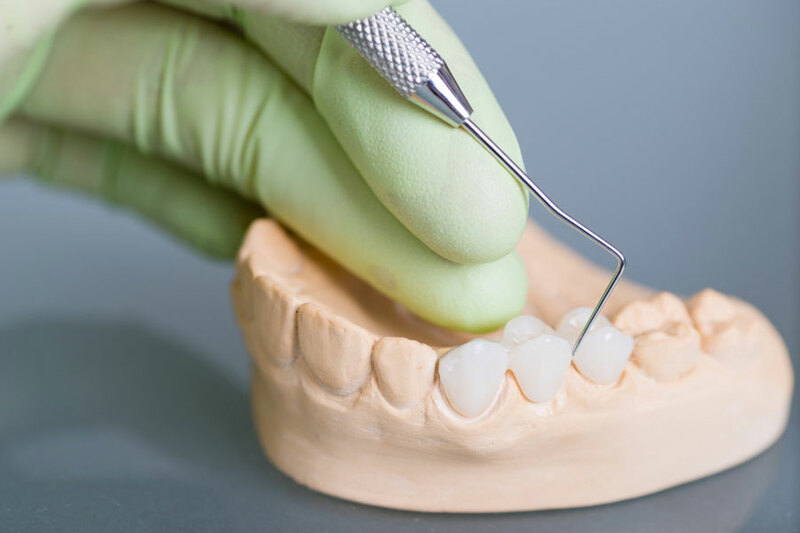 Q: What is the alternative to a partial denture? A: There are two alternatives: Bridges and implants. Q: What is a bridge? A: A bridge is made by constructing crowns on the teeth at either side of the space, and then joining these two crowns together by placing a false tooth in the space. The bridge is made in the laboratory by our skilled technicians, and then cemented into place in the mouth with special adhesives. The bridge cannot be removed. A: Providing you have strong teeth with good bone support either side of the space, yes; you can usually have a bridge. However, there must be enough teeth remaining to accept the increased load without endangering the health and prognosis of the supporting teeth. A: Bridges are usually made of a precious metal base or, more recently, of zirconia. In some situations bridges may be constructed using reinforced porcelains or glasses, but these are not as strong as the metal-based bridges. A: Although a bridge may seem expensive it will give many years of use. It will also improve your appearance and bite. Construction of a bridge requires considerable skills from the dentist and technicians, and in this way, it is similar to ordering a piece of hand made jewelry. The materials are also expensive so it is fair to say a bridge will not be the cheapest treatment you have ever had. A: You need to clean your bridge every day, to prevent problems such as bad breath and gum disease. You also have to clean under the false tooth every day. You will be shown how to use special devices, as a normal toothbrush cannot reach this area.